I am a huge fan of paint. A fresh coat creates wonders! I am still in the process of furnishing my home. Therefore, whenever I can save some money and find ways to reuse, recycle and upcycle? I am all for it. This is exactly what I did for my daughter's bed side table. This table lived a great life. It moved from one apartment to another apartment and then to a house. Looked great in all 3 living rooms. But as you can see from the Before image, it had seen better days. So I was ready to kick it to the curve. But all of a sudden, my DIY light bulb turned on!! Yeap! I went to Home Depot. Purchased some sand paper, paint (purple of course...) and repainted this piece of furniture in no time. My daughter loves it! Like she said: "Mommy, it is a brand new piece of furniture! that's awesome!" Awesome it is. 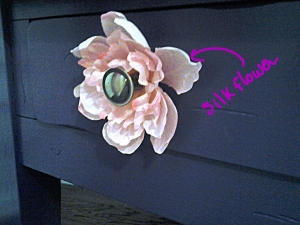 Plus, the little added touch with the silk flower with the knob just works so well with the overall decor of the room. I cannot wait to show you the whole room when it is done. In the meantime, hope this post inspired you to paint this season and if not read these posts: Kitchen cabinets and Craft Organization Wall. Maybe I will change your mind at the end to Refresh, Recycle and Reuse!